A Roman by birth, Felix was chosen as Pope on 5 January 269, in succession to Pope Dionysius, who had died on 26 December 268. Pope Felix I was the first to condemn the heresy of Paul of Samosata, who taught that Jesus was born a mere man, but that he was infused with the divine Logos or Word of God. Felix was the author of an important dogmatic letter on the unity of Christ's Person. 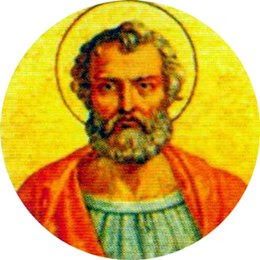 He sought the pagan emperor Aurelian's aid in settling the theological dispute between the anti-Trinitarian Paul of Samosata, who had been excommunicated and deprived of the bishopric of Antioch by a synod of bishops in 269 for heresy, and the orthodox Domnus, Paul's successor. Paul refused to give up his throne, and in 272 the emperor Aurelian was asked to decide between the rivals. He ordered the church building to be given to the bishop who was "recognized by the bishops of Italy and of the city of Rome", namely Felix. Though he was spoken of as a martyr in the Fourth Ecumenical Synod at Ephesus in 431, there was most likely a confusion of names and he probably reposed in peace on December 30, 274. According to the notice in the Liber Pontificalis, Felix erected a basilica on the Via Aurelia; the same source also adds that he was buried there. The latter detail is evidently an error, for the fourth-century Roman calendar of feasts says that Pope Felix was interred in the Catacomb of Callixtus on the Via Appia. The statement of the Liber Pontificalis concerning the pope's martyrdom results obviously from a confusion with a Roman martyr of the same name buried on the Via Aurelia, and over whose grave a church was built. In the Roman "Feriale" or calendar of feasts, referred to above, the name of Felix occurs in the list of Roman bishops (Depositio episcoporum), and not in that of the martyrs.